"Just wanted to send you a quick note to say thank you for all your help. Our trip was amazing, the best vacation we have had in 10 years. Mariposa was beautiful but our stay at Mille Fleurs was amazing. Both villas were unbelievable and we really had a great time at both. Look forward to booking back with you on our next trip"
"I wanted to let you know we enjoyed our week at Jardin Creole very much. The villa was very pleasant and worked out just great for us. We particularly enjoyed the view, pool and the outdoor areas, as well as proximity to the beach. Thanks for your recommendations! We are planning to return to St. Martin and wanted to reserve now for next year. Thanks again." "What a great island. We ate well, frequented the many wonderful beaches on the island and the villa really worked well for us and our kids. All and all we had an amazing time and the villa helped make that happen. I would not hesitate to rent out the villa again and recommend it to others. I want to thank you for providing helpful hints and great accommodations"
"Just want to let you know we had a fabulous time at Jardin Creole – really loved the home – and everything was well taken care of. Feel free to add us to your list of references." "I meant to write to you myself and thank you, but you know how it is coming back from vacation. We all loved our stay at the house. You were right, the house, its location, the beach and everything else was great. Anthony was very kind and attentive, and we all adored the dogs. We would definitely go back there. Again, thank you." "David, we are back from our trip and want to let you know we thoroughly enjoyed our time on the island. The villa is beautiful, but we did have a little problem with the wireless internet connection. Our housekeeper was excellent and we did leave cash behind for her and would like to know that she got it. We could not wait to say good-bye. Would you please look into our staying again next year - same time. The weather was some of the best we have ever had on the island and we have been there many different months. Please get back to me with any information you may have. It has been a pleasure working with you and your staff"
"Overall it was a great trip. Everyone, as I said, was over the moon about the villa. The catering company you coordinated really did "make" the trip & managed to increase our overall sizes dramatically!! David our chef was fantastic and I hope to spoil a few other family members with his services sometime in the near future. The island itself was beautiful & anyone who says that you\'ll never want to go anywhere else again is probably right. I got my wish & slept outside the entire trip, except one morning that I got pushed in by the rain. Being on the Anguilla side saved us from the extreme heat & I would probably pick that side again. We did not get to see quite as much as I thought, but I managed to drive, without too much issue, into Maho, Philipsburg & Marigot. So all in all David you were absolutely right on with ALL your help & advice. I know I have said it a million times already, but it was a pleasure working with you & I sincerely hope to do so again in the future. A big thank you from all of us." "Our holiday was really good. The villa was perfect, chef was excellent, weather just great. We went to see some of your other properties more out of curiosity than for a practical reason. I think the one we stayed was the best or suit us the best. Shortly I will let you know the dates we\'ll be looking into in March"
"We had a fabulous relaxing time in Jardin Creole. Really appreciate your suggestion for renting this villa. Jardin Creole is a real class act. We have rented many villas in St Barths over the years so I have a lot to compare with. We found everything we needed. We also were very impressed with your service staff, from their greeter at the airport, the greeter at the villa and a quick response to a problem with the cable TV. I can assure you the next time we can have a getaway, the very first thing I will do is contact you to see if this villa is available. We spent more hours in and around the most fantastic pool we have ever had than doing anything else except dining and sipping lots of wine. Since St. Martin is close enough to the Virgin Islands in case of bad weather, we may want to pop over again in the Fall. Thanks for your service and we look forward to doing business with you again in the near future." "Just got back from St. Martin and La Siesta and everything was great. The villa was wonderful. Fantastic location/views. The weather couldn’t have been better. Your concierge was absolutely great. We had a bit of a medical emergency and she went above and beyond in helping through this situation (not to mention the other information she provided throughout the trip). David, if you ever need a referral from a satisfied customer, please do not hesitate to use my contact information. When my (or anyone I know), future vacation plans call for renting a villa in the islands, I will definitely contact you first." "David we had a great time the Villa was superb and we are already discussing our next trip thanks again." "Hey David! Our trip was awesome, thank you! The villa was beautiful! Beautiful island. Enjoyed your dining selections! Tropicana was one of our favorites. The roadside grill place was out of lobsters but we ate there anyhow. Loved the butterfly farm. It was funny but my son was actually afraid of them. I appreciate all of your efforts to make our trip so nice. Thank you!" "David, I\'m glad you e-mailed, I was going to as soon as I caught up at work. We had the best time and the villa is wonderful. I really liked the location because it was not in the middle of everything. The house keeper was so nice we throughly enjoyed her. Your company has everything so thought out that I don\'t think we could of asked for anything else. I don\'t know how soon we will be traveling again but I would definitely use you in the future. If I can recommend you I will. Thank you so much again for everything"
"Just to let you know what a wonderful villa Jardin Creole is. Last week the six of us just loved everything about the villa!!! We found that if we sat down around the pool in the morning it took all of our efforts to unseat ourselves and leave the villa. The housekeeper was very personable and kept the villa beautifully. My husband and I used the bedroom next to the pool, the one pictured in the magazine, and felt very comfortable in it. It was our first time staying on the island, we had visited before but from a sailboat. 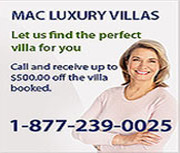 Jason from MAC Caribbean Villas recommended the villa and he was right. Thanks again for such a wonderful place to stay"
"We were very pleased with our stay. We liked the Island, and the villa was fabulous. It certainly had everything that we needed; the kids enjoyed the pool, there was plenty of space, and we cooked up a storm!!" "The Villa Eden... 5 stars! It was perfect! The location was ideal... breathtaking view... very spacious. The caretaker of the villa was Ashley... 5 stars... very nice... very accommodating, low profile and very helpful. We loved the Villa... it was all you said it would be David! I\'d give you 10 stars on a scale of 1-5!!!!!" "First we want to say a big THANK-YOU for renting us such a wonderful Villa as Jardin Creole! We had a terrific time in St. Martin! The location of Terres Basses and it\'s Baie Rouge beach was SUBLIME! Our agenda was quite busy but we still ran out of time to do all of the things we had wished. We chartered a private boat to take us to paradisaical beaches plus a visit to Anguilla. Our captain Paul from Marseilles made this trip the highlight of our stay. We ended up going out once more with him to snorkel. The beaches are some of the best we have EVER seen! The restaurants where we ate every night the service and food was excellent. We loved La Cigale and Les Boucaniers the most. We did Philipsburg one evening at the Holland House on the boardwalk. Once again thank-you to you and your team David. We had a fantastic time 10 out of 10!!!" "We had a great time - I realized once we walked in the villa that we had rented it many years ago. The owners have done a lot of work especially on the outside landscaping which was almost non-existent previously. It is a very comfortable villa and the views are spectacular. We will be renting again next year - sometime towards mid February. I will be in touch within the next couple of weeks to reserve date. Many thanks for all your help and we enjoyed it immensely"